In this post, you will see the biggest one-day drops of Dow Jones in the last 20 years. You will also see the method used to measure the drops. We are not going to measure in “points”. We will be applying “percentage” units. The reason is simple. Investors calculate profit/loss and net-worth in percentages and not points. Since the start of February 2018, the Dow Jones has been plummeting. (The time of writing this post is Feb 9, 2018.) Media has cited several reasons for the drop. Prominent ones are a fear of interest rate hikes and increasing bond yields. Based on “points” units, the recent drop seems frightening. (The drop is over 2200 points between Feb 5 and 9.) Looking in percentage units the fall is not the biggest. 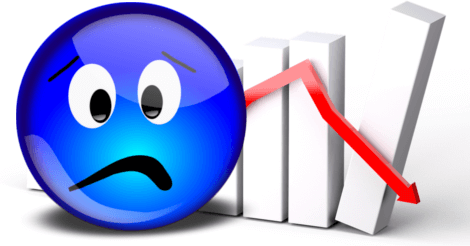 In this post, you will see top ten biggest drops of DJI in the last 20 years. You will see whether the much-hyped Feb 5 drop of 1000 points is a part of the list. How Are We Going to Measure the Largest Drops? Step 1: Open DJI page of Yahoo Finance. You can go to that page by typing DJI in the search box on top of the website. Step 3: In the “time period” field, choose the range from 09-Feb-1998 to 09-Feb-2018. We are doing this because we are interested in last 20 years data. In case, you want are interested in a different timeframe, you can choose accordingly. Step 5: After step 4, you will see the data for last 20 years on your monitor. Now, you have to download the data as CSV file. This file will help you to compute using Excel or Libre Calc. (Libre Calc is an opensource spreadsheet software similar to Excel). 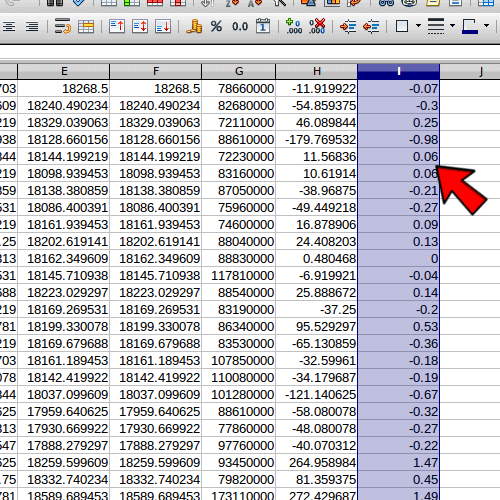 After you click the “Download Data” link, the CSV will be saved to your desktop. 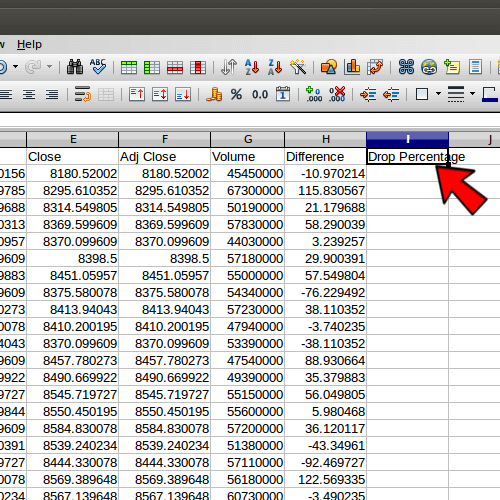 Step 6: Open the CSV file in Excel or LibreOffice Calc. Step 7: Add a column “Difference” to the right of “Volume”. We are going to use this column to display the difference between opening and closing prices. 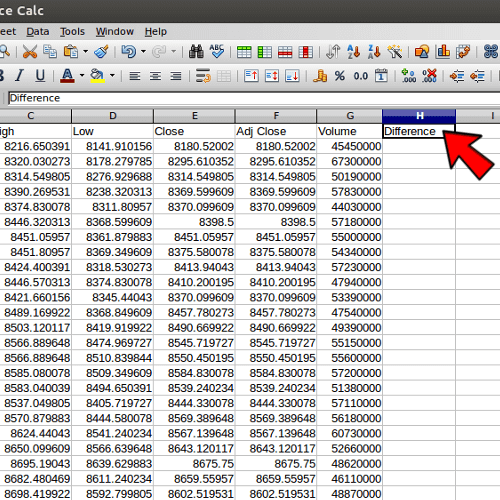 Step 8: Enter the below formula in column H2 below the header “Difference”. After typing the formula hit “Enter”. You will see the difference between opening and adjusted close prices for Feb 9, 1998, in the cell “H2”. Do you wonder what is “adjusted close”? Do you want to know why we are using “adjusted close” instead of just “close price”. Here is your answer. Adjusted close will account for actions (outside of the stock market) by corporates that impact prices. Only on rare occasions, the difference between close and adjusted close will be significant. Read more about adjusted close here. Step 9: At the bottom right corner of H2, you will see a black square. If you place the cursor over the square, you will see a “plus” icon. Now drag the “plus” till the end of rows. This action will copy the formula into all the cells of “Difference” column. For example, the formula in H3 will be =F3-B3, the formula in H4 will be =F4-B4, and so on. 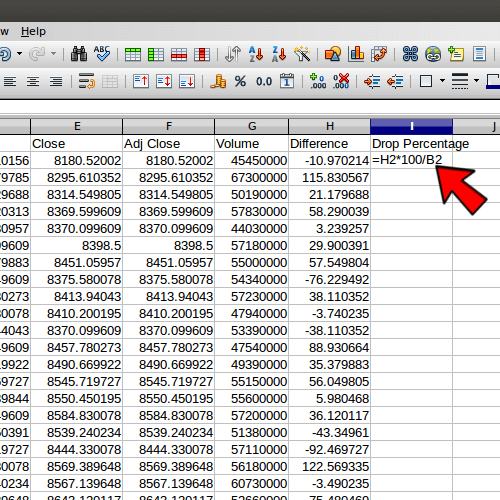 Step 10: To find the percentage drops, you have add a new column to the right of “Difference” column. Let us call this new column “Drop Percentage”. 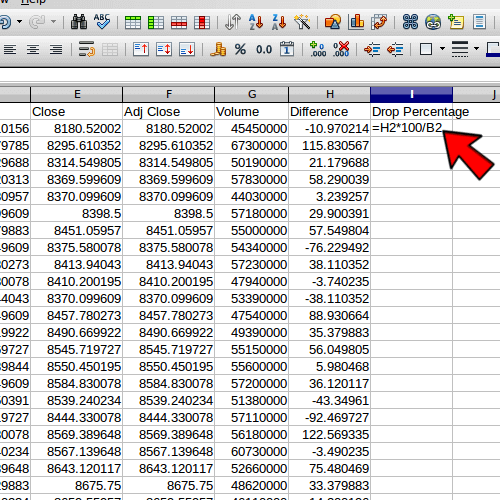 Step 11: Now enter the below formula to calculate Drop Percentage in the column G2. Once you hit “Enter”, the percentage drop for Feb 9, 1998, will populate in G2. A negative value indicates a drop. A positive value indicates that the DJI has closed higher. 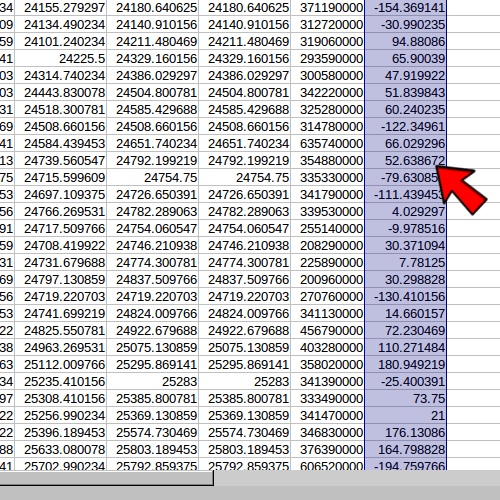 Step 12: Now, we have to drag the formula of I2 until the end of data. This action will apply the formula to all cells under “Drop Percentage” column. Step 13: We have come to the final part. To find the biggest drops, you have to sort “Drop Percentage” column in descending order. To do this, just select the column “Drop Percentage” and click on the icon for ascending sort. Usually, this icon will be displaying “A->Z”. You will see a dialog box with options like “Extend Selection” and “Current Selection”. Choose “Extend Selection”. Step 14: You will see the biggest drops in order in the column “I”. Can you find where the drop of Feb 5, 2018, has figured? The answer is a modest 31. This means, there are 30 bigger drops than the much-hyped Feb 5th one. Note: A drop measured in points may blow the real impact out of proportion. As mentioned earlier, Investors measure their gain or loss in percentages and not points. Now for your information, below is the table for biggest 10 drops in the last 20 years. 6 of the top 10 drops are during the infamous 2008 recession. Human psychology dictates that a news that creates panic is read more than a positive one. Stories sounding “biggest drop”, “market bloodbath”, etc go viral. These stories bring in readership for the media companies. But ignorant investors resort to panic selling. Human emotion is an important factor responsible for stock market price movements. Your lesson is this – During times of market crashes, be composed and analyze well before making decisions. Following tide often hurts investors. What Was Elon Musk’s First Business? Did He Succeed?